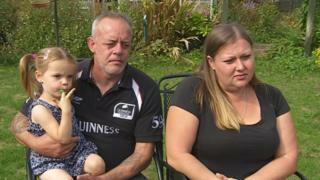 Image caption Gemma Matthews and partner Carmine Lane believe their son Norbert would be alive if their concerns had not "been ignored"
A woman whose baby was stillborn believes he died because her concerns that she could not feel him moving were ignored by hospital staff. Gemma Matthews was 29 weeks pregnant when she contacted Bath's Royal United Hospital (RUH) in January 2015. She was told to visit a birth centre where test results showing her baby had a low heart rate were faxed to the RUH. Ms Matthews was sent home but the next day there was no heartbeat and her son Norbert was stillborn a few days later. Royal United Hospitals NHS Trust said it worked continually to improve its care and reduce stillbirths. Ms Matthews and her partner Carmine Lane, who live in Melksham in Wiltshire, are now pursuing a clinical negligence claim against the trust. She said: "Why didn't we follow our own instincts and just go to Bath anyway, then it would have been harder for them to ignore us?" Ms Matthews said when she and Mr Lane visited the birth centre in Trowbridge on 6 January, the foetal heart rate was monitored and found to be "very, very low" with a baseline of around 110 beats per minute. Ms Matthews said the cardiotocography (CTG) results were sent to the RUH and the couple "just played the waiting game". Mr Lane said he asked if they should just go straight to the RUH, and was told by the midwife: "If I was in any doubt that there was a problem I would send you to Bath." Ms Matthews added that after waiting until midnight, the midwife said: "They are not going to look at [the results], they are a bit busy so I suggest you go home." The next day the couple attended the RUH's day assessment centre and when the baby was monitored again it was discovered the foetal heartbeat had stopped. Ms Mathews said her "gorgeous little boy" Norbert was stillborn three days later. A Freedom of Information request by BBC Points West found there were 22 stillborn babies delivered at the RUH maternity unit in 2015. The hospital has been labelled as "red" by MBRRACE-UK (Mothers and Babies: Reducing Risk through Audits and Confidential Enquires across the UK), meaning it has a perinatal mortality rate more than 10% greater than the national average. In a statement, the NHS trust said: "The safety and welfare of mothers and babies is of paramount importance. 'We work continually to review and further improve the care we provide to reduce the risks of stillbirth and neonatal death." It added that after implementing NHS England's best practice guidance on foetal monitoring and infant risks, it had seen a "significant reduction in the number of stillbirths".